Of course, for our New Year’s Day magnum bottle extravaganza, we also had to have Riesling. And since that grape is such a big topic on this blog and also a personal favorite, we directly included 2 bottles. One from the Saar region, and one from the Mosel, both from the same, fresh, 2008 vintage. 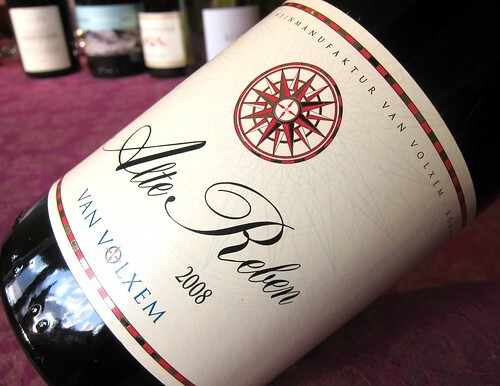 The Alte Reben Riesling is actually one of Van Volxem‘s basic wines, but as the rest of winemaker Roman Niewodniczanski‘s portfolio, it follows the principles of hand-picked grapes and spontaneous fermentation. Interestingly, over the past few vintages, the Alte Reben proved to have variations of the degree of dryness or sweetness, but somehow tends to be made in a more dry fashion with every new release. I’m not sure about the circumstances of fermentation, if they let it stop naturally, or control it. Unfortunately the winery’s website is scarce with information (admittedly, they have nice pictures). Anyhow, I have nothing against this development. This 2008 Riesling shows the typical, smoky slate aromatics in the nose, the region’s signature smell, but also lots of ripe and juicy apricot fruit. It appears mysterious and seductive at the same time. On the palate this one has a tiny but clear sweet edge, but also a very firm bite, procured by a juicy yet elegant acidity. At the same time one even has the impression that there’s even something like tannic grip that lies within the wine. Of course, the ripe apricots are there as well and they seem elevated by that juicy and elegant acidity. Finally, the whole construct is infused with loads of smoky minerals and in the finish a touch of herbal bitterness also shows. This wine’s a joy to drink, it combines ripe fruit with a certain complexity. The acidity adds freshness and also helps with drinkability. The bottle was the first to be emptied that evening, which probably, or even unmistakably means that this was the wine of the night. And at a price of around 35 Euro for a magnum bottle, it is also a very good deal.